MVAgusta.net > Technical and Hands On > Maintenance & Tech. Issues (3 Cyl. Models) > New service bulletin for three cylinder models? New service bulletin for three cylinder models? As part of a continuous product improvement programme, MV Agusta have released a service bulletin advising us of a free of charge replacement programme available for the clutch and Cush drive components on certain models. This important work is available on all UK motorcycles as listed, free of charge. Does anyone know anything about this? It’s not listed with all the other technical bulletins on the MV website. Last edited by colinpp; 11-15-2018 at 12:31 PM. Appears to be same as the one for the Turismo dated 30May16 # 168. I am waiting for parts for my Turismo '16. I will follow up my Mv dealer and see if my bike is covered for this. I too am wondering if this has made it to AUS as my bike is due for a service and well out of warranty. 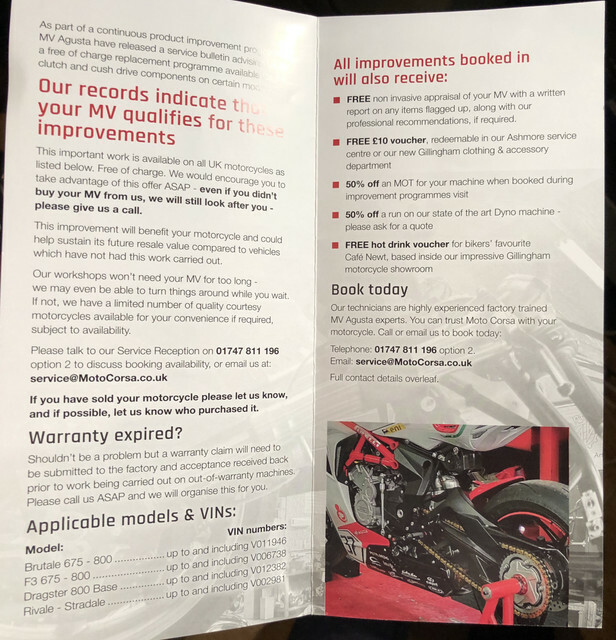 The motocorsa brochure is a bit confusing as it refers to cush drive AND clutch upgrades where the MV bulletin only refers to the cush rubbers within the clutch. It would be nice for MV to give me a new "old" style rear wheel hub cush assy but I don't think that'll happen. My bike is very low km and already has substantial axial wear on the hub rubbers. I also sent a query to MV Agusta Australia for clarification of this. I will update if I receive a reply. I spoke to my dealer here in Sydney - they are awaiting the list of vin numbers of applicable bikes from Italy to clarify the scope of the bulletin. If yours has a higher number you're good. If lower its time to ring the dealership. I was notified of service bulletin 214 a couple of weeks ago when i called my dealer regarding the ongoing issue with my clutch repair. It is pretty much the same as service bulletin 168 for the Turismo but has been extended to cover more bikes.